Vegan MoFo – Soupstock, I came, I ate, I ate some more. – vegan in your city. Home Toronto Vegan MoFo – Soupstock, I came, I ate, I ate some more. 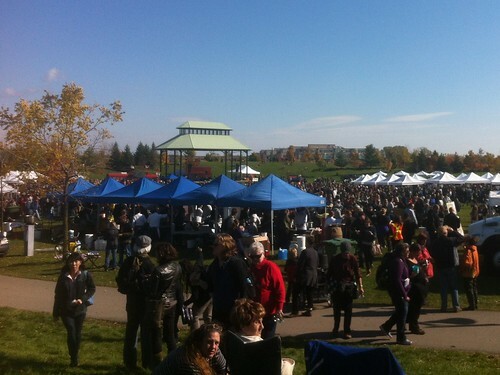 Vegan MoFo – Soupstock, I came, I ate, I ate some more. 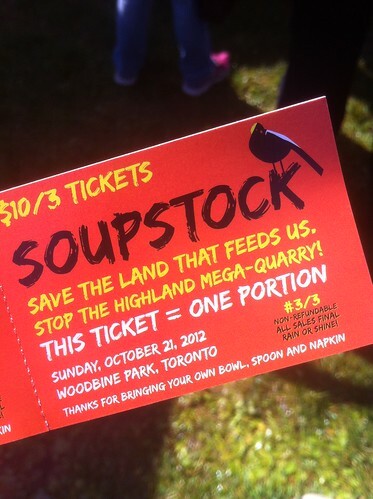 A highlight of this weekend for me was Soupstock, an event presented by the Canadian Chefs’ Congress and the David Suzuki Foundation. The whole premise was a celebration of local. Food, chefs, musicians, gathering together to raise awareness about (and support against) the Highlands Mega-Quarry. Some background information about the quarry can be found on The Soupstock Quarry page. With links to the David Suzuki page and NoMegaQuarry.com there is lots of information to read. Anyway, we went to Soupstock on Sunday, and it was one of those great days where the weather was entirely in favour of a large outdoor event. Woodbine Park was full of people, full of vendors, and full of entertainment. Upon walking in to the space with our purple bowls from home, a friendly volunteer handed us a map, and directed us to buy tickets. 10 dollars for 3 bowls. The map was exciting because it had vegan (purple), vegetarian (green), and non-veg options colour coded. Or at least it seemed to, but it was apparently very “subject to change” and many of the places marked vegan ended up being not vegan at all. 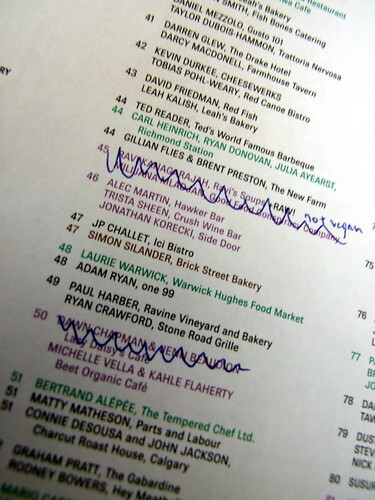 Disappointing, but not unexpected based on attending past “local food” events. On the bright side there were great options from a variety of restaurants that were familiar and some that weren’t so familiar. Another great touch was the steady stream of entertainment. George Stroumboulopoulos (and you know… vegan) and Jeremy Taggart MC’ed and while we were onsite we were entertained by Choir! Choir! Choir!, a joinable choir in Toronto (check them out on SoundCloud for more information) and then later by the hip hop foodie stylings of More Or Les. He modified this song for the event and I loved it. – p.s. everything is better with soup and bruschetta. We tried a creamy (vegan) parsnip soup from The Beet Cafe. Easily the favourite new find of the day (we went back for seconds.) We’ve been to the Beet Cafe before, but the soup So I looked around for more information about them online, and in doing so, found out that The Beet Cafe has Vegan Thursdays – mentioned on their facebook group… Sounds good to me! 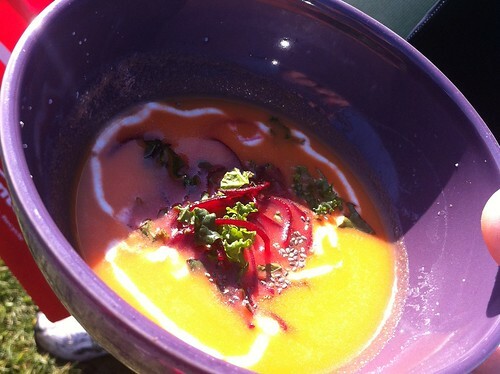 We also had a tasty sweet potato and coconut soup from Urban Herbivore. Paired with a couple of crispy breadsticks. It fit in with my preferred soup of the day, blended and creamy. We also tried the Curry Coconut and Lime Soup from Hall’s Kitchen. 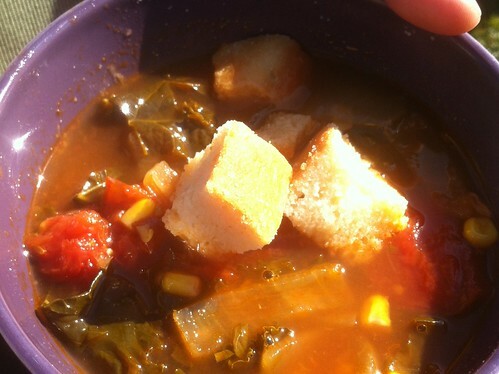 LPK’s Culinary Groove had a Roasted Tomato, Corn and Kale soup topped with some of their gluten free bread. A swish chard soup from Jamie Kennedy. It was interesting, and the swiss chard came from their own farm, which is always kind of cool. I especially enjoyed the giant cauldron of soup and the diced mushroom garnish. After all of these, we went back for two final bowls of soup from The Beet. 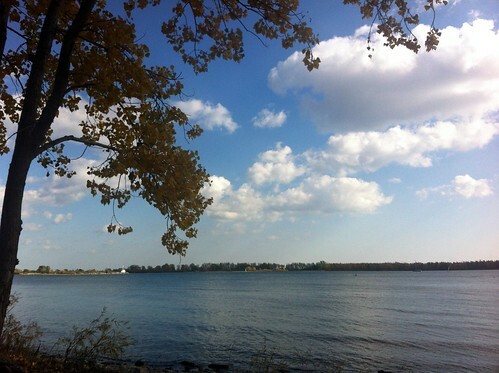 It was one of those great weekend days, so after we filled our bellies full of soup, we went to Cherry Beach at sat by the water watching people sail on Lake Ontario. I love autumn. What’s your favourite kind of soup? Belmonte Raw, Cherry Beach, Halls Kitchen, Hawker Bar, Jamie Kennedy, LPK, Soupstock, The Beet Cafe, Urban Herbivore, vegan. Bookmark. Vegan MoFo – Challah becomes French Toast. So much soup!! I think the parsnip would have been my favourite too. 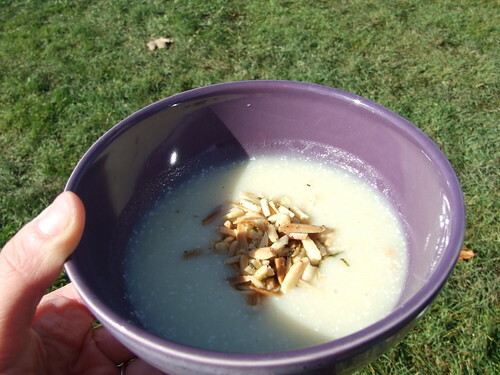 I had a creamy jerusalem artichoke soup topped with mushrooms & roasted cobb nuts the other day – it was delicious. 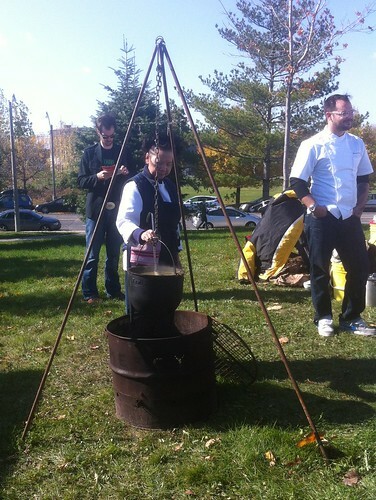 I was at this event too and funny I also had the parsnip soup as well…it was awesome. What a great event – as someone who grew up in the area where they are trying to dig this quarry – I was happy to see something is being done to fight it. Everyone should be outraged they are trying to pull this fast one on us. That parsnip soup looks like it would be the best of the bunch but then I’m slightly biased towards more creamy soups. I can’t get over how many events go on in your city, they sound like so much fun!